Heads Up! 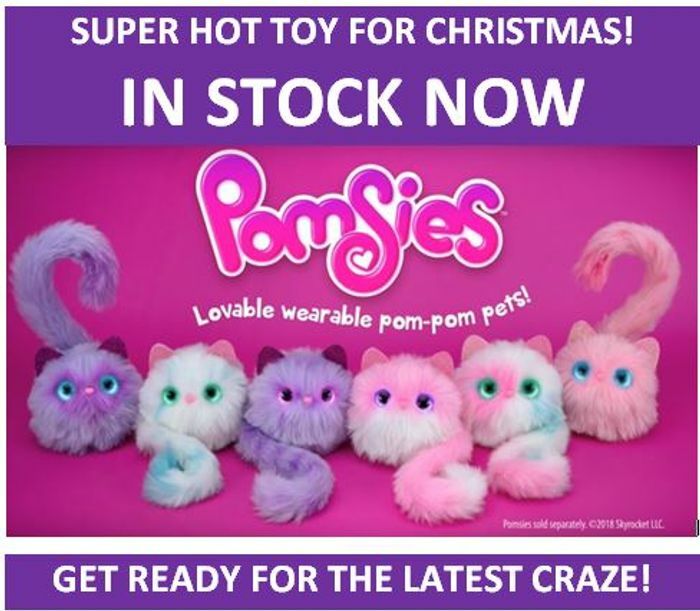 The new Pomsies toy craze is staring! I predict Pomsies will be one of the hottest UK toys of 2018. Trust me, Pomsies are going to be a hot hot hot top toy this year. Remember Hatchimals, Fingerlings Monkeys, Luvabella? I reckon this is one toy to get and tuck away early (whilst you still can!) and be a cool Mum or a hot Dad! Massive brownie points. Where to buy Pomsies in the UK? Pomsies are interactive, cute, furry, wearable plush toys that react to your every move with up to 50 different cute sounds and their adorable large light-up eyes. Pomsies have soft cuddly fur and a twist-and-lock tail that you can wrap around even the smallest wrist. Kids can wear and take their new best friend with them wherever they go by wrapping their Pomsies’ tail around their wrist, ankle, backpack or school bag. Girls can even wear their Pomsies in their hair! Kids will love it that Pomsies are so interactive. Pomsies are something like a Fingerlings Monkey only bigger, softer, and much, much, cuter. Touch sensors allow you to pet, hug and care for your Pomsies and listen to them purr and coo. You can even feel them purring too! There are two modes the Pomsie can be in - Loving mode and Freeze Dance. The Freeze Dance mode is activated by holding down the nose for a second or two. Once the first whistle blows it's time to dance. You can move your Pomsies pet to the beat of the Meow, Meow, Meow jingle. When you hear the whistle, it's time to stop and freeze. Watch the Pomsies YouTube videos to understand what I mean! What Pomsies are available in the UK? Here's an image of nine pomsies I know about in the Pomsies range, including the exclusive Pomsies Unicorn Luna (available at Smyths Toys) and the exclusive Pomsies Sherbet (available at The Entertainer). I've not found Pomsies Stardust available yet (theb blue one), but it's coming soon! Part of the appeal of Pomsies is that they are priced low enough to be collectible, so I expect the range to grow fast. Pomsies Snowball – white. Snowball might look frosty, but she’s a sweetheart inside. Pomsies Pinky – pink. Pinky is quiet but loving, you can tell her all your secrets. Pomsies Boots – purple /teal. Boots is carefree and wants to follow your dreams with you. Pomsies Patches – thinks stripes are highly over-rated! Patches is feisty, and she loves people with lots of personality. Pomsies Blossom - Blossom loves playing in the meadows, with her friends and with you. Pomsies Speckles - Speckles loves nothing more than having a dance and a good time. Pomsies Sherbert (exclusive to The Entertainer). You can never be too sweet! I expected dogs not kittens. Why are they not based on pom dogs? I bought my daughter fingerlings last year, I was on every shops stock list. As soon as they were in I drove 18 miles and got them. Guess what never used so I guess this will be the same. Most wanted toy but never used as like fingerlings they probably don't do alot!! Guarantee il be roped in though to buy one!! !